John Curtin became Australia's 14th prime minister when Arthur Fadden's minority Coalition government lost the support of two key independents. 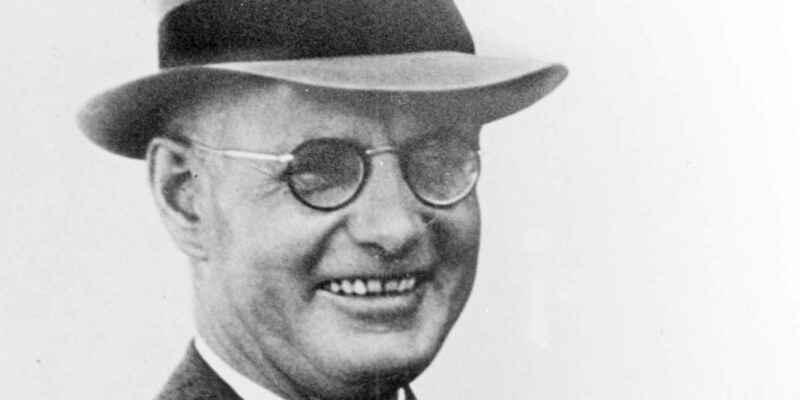 John Curtin united his party and led it to power, and united the nation in war and led it to victory. Curtin possessed a great ability to gauge the public mood, to sense how much to push for an even greater effort to support the war. As an often lonely figure, weighed down by the burden of the conflict, Curtin conveyed to Australians a shared responsibility for the outcome. The introduction of daylight saving time occurs across Australia on 1 January 1942 under National Security Regulations. It is used as a means to conserve fuel and electricity. On 19 February 1942 Darwin is attacked by Japanese aircraft, just four days after the fall of Singapore to Japanese forces. General Douglas MacArthur is announced as the Supreme Commander of the South-West Pacfic area. American troops were already based in Australia when he arrived on 18 March 1942 to establish his headquarters. A torpedo fired from a Japanese midget submarine strikes the HMAS Kuttabul on 31 May 1942, with the death of 19 naval personnel. Two other midget submarines are captured off the Australian coast. The Income Tax (Wartime Arrangements) Act is passed on 7 June 1942, enabling the Commonwealth to assume control from the States of the power to levy income tax. The Department of Post-War Reconstruction is established on 24 December 1942, with Dr H.C Coombs appointed as Director-General in January 1943. An embassy for the Soviet Union is established in Canberra on 3 March 1943, followed by the posting of an Australian diplomat to Moscow. The Labor Party's Dorothy Tangney arrives in the Senate and the United Australia Party's Enid Lyons arrives in the House of Representatives, following their electoral success in the federal election of 1943. On 21 January 1944, the Australian and New Zealand governments sign an agreement to consult and work together on security and defence, the welfare of all Pacific peoples and the status of post-war territories. 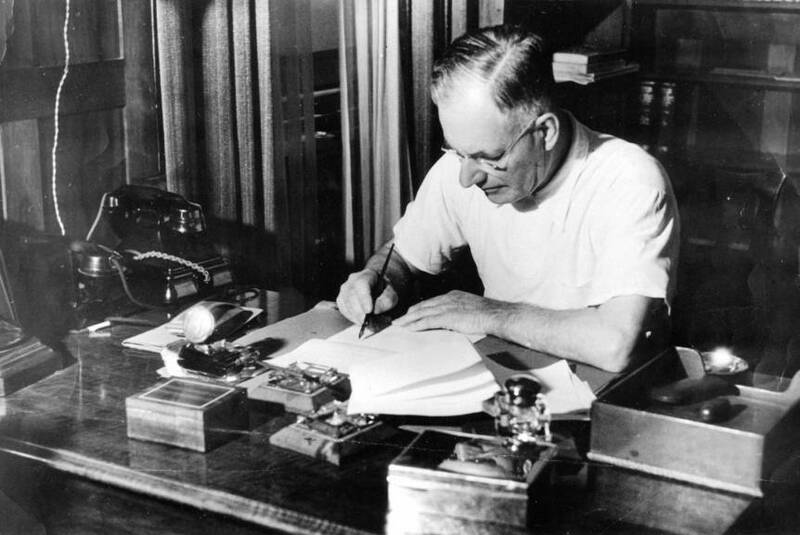 On taking office in October 1941, Curtin announced that the task for Labor was to win the war and, until that was achieved, social reform would be deferred. Curtin established the Allied Works Council in February 1942 to arrange for the construction of major capital works essential for defence. Additional national security regulations were passed to increase the emergency defence powers of the government. State governments were convinced to surrender their power to raise income taxes to allow Commonwealth control of revenue for the war effort. Curtin’s decisive victory in the 1943 election resulted in a substantial parliamentary majority in both chambers and, with the imminent Japanese threat over, the focus became post-war reconstruction. A widows’ pension scheme was introduced and the goal of restoring full employment was accorded priority. In February 1944 the Coal Production Bill was introduced to deal with long term industrial unrest that threatened coal supplies. Curtin initiated constitutional amendments in August 1944. These became known as the Fourteen Powers referendum and sought extended Commonwealth power over production and distribution, prices, monopolies, national infrastructure, national health and family allowances. The referendum proposals were rejected by the public. Curtin assumed the Labor Party leadership in October 1933 and set out to unify and heal the wounds that had crippled the party since the defection of Joe Lyons. The onset of the Second World War brought tensions to the surface again, with divergent views including pacifist, isolationist, socialist and communist. Curtin constantly ‘talked, wrote and persuaded people’ to gain party consent before embarking on any new action. It was recalled by one colleague that he ‘could judge the temper of his associates and keep them all running smoothly together. He could smell plotters and rebels and had wonderful timing.’ In November 1942, Curtin had to make one of his most difficult decisions, overturning his lifelong opposition to conscription by allowing limited overseas service for Australian conscripts in New Guinea. When Cabinet discussed the matter Eddie Ward was reported to have said “You’re putting young men into the slaughterhouse, although thirty years ago you would not go into it yourself.’ Arthur Calwell also strongly attacked Curtin over the conscription issue, with Curtin inviting caucus to dismiss him. Curtin managed to broker the policy through the party executive and caucus, but he was never entirely comfortable with it. On 14 March 1941, John Curtin met Tatsuo Kawai at a reception held in his honour, as the first Japanese ambassador to Australia. It was to be the beginning of an unlikely and politically risky relationship for both men. With Australia involved in conflict in Europe and North Africa, Curtin did not believe the country needed also to be engaged with an enemy in the Pacific region. Curtin left a strong impression, with Kawai writing ‘And in this world, in a strange country, this politician of such distinctive character appears.’ In July 1941, Kawai was invited by Curtin to meet his family at Cottesloe in Perth. Curtin was condemned by both political opponents and the press for hosting a representative of Japan. The personal papers of Kawai reveal that the two discussed the possibility of a peace arrangement between Australia and Japan. 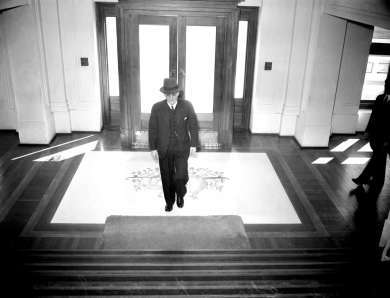 After Curtin became prime minister in October 1941 it was clear that events could not be altered. Only ten days before the Japanese attack on Pearl Harbour, Kawai met Curtin at Parliament House and responded to Curtin’s concern about war saying ‘I’m afraid the momentum is too great.’ Before returning to Japan in 1942 Kawai sent Curtin a simple signed farewell card with the letters ‘P.P.C.’ standing for ‘presenting parting compliments.’ In 1959, while visiting Melbourne as a Japanese trade fair representative Kawai called on Elsie Curtin and visited Curtin’s grave. The pursuit of knowledge is far more important than even knowledge itself. It involves discipline and training which, in turn, are moulders of character.